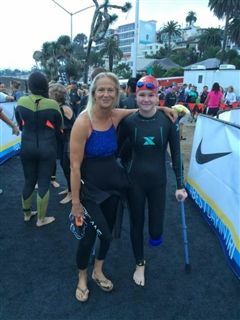 Girls Varsity Lacrosse Coach Liza Neptune recently served as a buddy swimmer at the 2015 Aspen Medical Products San Diego Triathlon Challenge. Athletes of all physical ability levels competed in the event, which raised more than 3 million dollars for the Challenged Athletes Foundation. Coach Neptune has participated in the event in the past as part of a fundraising relay team, but this was her first time participating as a buddy swimmer. She was paired with Kelly, a 13-year-old athlete from Connecticut, for the mile-long swim. Click here to watch a video of the inspiring event.